One hundred years ago this year. the guns fell silent across Europe. in the village of Stretham, people began to look forward to the return of their loved ones, or to accept that their own loved one would never come home again. Children at the school are investigating people who fought in the war, and their work will be displayed in the church, along with other work associated with work that they have undertaken about the War. Mike petty, well known local historian, will be giving a talk about the effects that the war had on the local community, and the men who went. The Stretham Outreach Singers have been rehearsing songs from the period, both popular music hall ones, and also some of the songs sung in the trenches. We would like to appeal for a little practical help. Would you be prepared to help to display things on the 8th and 9th of November/ We need people to steward too on the Saturday and Sunday afternoon. It doesn’t have to be long – an hour would do. Would you like to help provide the tea/ coffee for the Saturday or Sunday afternoon? Any offers of practical help would be greatly appreciated. 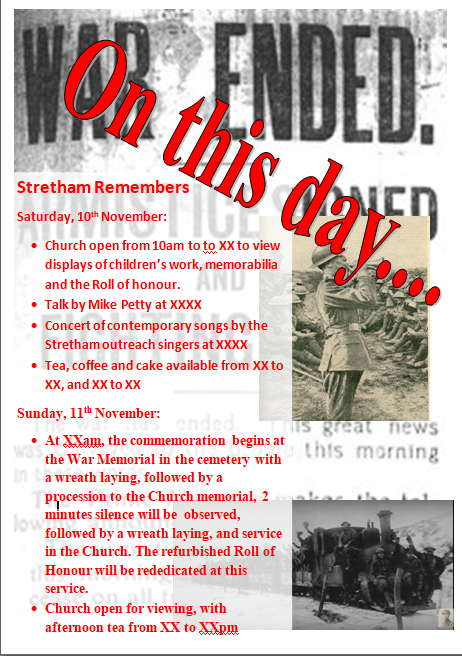 Contact Ken Ellis on stretham1918@yahoo.com or 0785 4807113. Come and be part of the event.